Artifex Contemporary Arts, Sutton Coldfield, West Midlands. 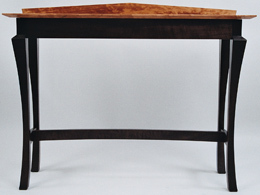 British craft furniture is well represented and skillfully promoted by this gallery. Celebration of Craftsmanship & Design, Cheltenham, Gloucestershire. The exhibition takes place near the end of August each year and is organised by Jason Heap. Langton Green Gallery, Tunbridge Wells, Kent. Owned by Neil Redpath who sources and displays a permanent but rolling collection of contemporary furniture. Below are listed most of the exhibitions and shows I have taken part in. My records are incomplete because I didn't note the date and venue of some events; it is due to this that there are gaps, particularly for the period 1983- 1993. 2013, May. MAKERS, The Cube Gallery, Manchester. A mixed media exhibition involving members of NCFM and craft workers in a range of other disciplines, eg, ceramics, silversmithing, weaving, etc. 2010, September. Northern Contemporary Furniture Makers autumn group exhibition, Tennants Auction Centre, Leyburn, North Yorkshire. 2009, October. Northern Contemporary Furniture Makers autumn group exhibition, Tennants Auction Centre, Leyburn, North Yorkshire. Click here for images of the exhibition. 2008, November. Creative Networks, Leeds College of Art and Design. 2008. Northern Contemporary Furniture Makers autumn group exhibition, plus guest artists, October- November. Tennants Auction Centre, Leyburn, North Yorkshire. 2008. Northern Contemporary Furniture Makers summer group exhibition, June-September. Arcaz, Whaley Bridge, Derbyshire. 2007. Northern Contemporary Furniture Makers group Exhibition, August- September. Tennants Auction Centre, Leyburn, North Yorkshire. 2001-2002. Fire’. Mixed Media Events hosted by Kelly Gale Amen at the KGA Compound, Houston, Texas. 2001- 2003. Invitational Exhibitions of Texas based designers, makers and artists. Gallery 3, Houston, Texas. 2000. The Hand That Forms. Gremillion & Co., Houston, Texas. 1999. Houston Furniture and Design Expo, Houston, Texas. 1999. Philadelphia Furniture and Furnishings Show. 1998. Gensler Architects, Houston, Texas. Invitational exhibition. 1998. Expressions in Three Media. Brazosport Art League, Texas. Invitational Exhibition. 1995-’98. The Magic School Bus: Inside the Earth. Travelling exhibition created by The Children’s Museum of Houston, Houston, Texas. 1982. Today’s Furniture. Juried exhibition, Rowley House Museum, Shrewsbury. 1982. The Graduates of ‘83. The Shirehall, Shrewsbury.